It appears that China is ready to re-enable some speculative excess once again in its stock market. Bloomberg reports that China is considering a relaxation of stock-index futures trading curbs that were introduced during the nation’s 2015 market crash, people familiar with the matter said. 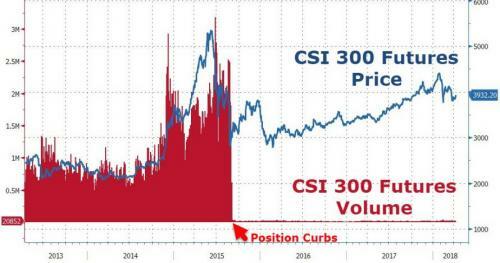 No, that is not a misprint on the chart, volume dried up in 2015 after regulators blamed the derivatives for exacerbating equity losses and cut position limits by 98 percent. Daily trading in the contracts is still about 99 percent below its peak, despite a small relaxation of curbs in February 2017. Looser restrictions are likely to be welcomed by hedge funds and other professional money managers who depend on futures to implement their investment strategies in a market where shorting stocks is difficult. However, an ulterior motive for Chinese authorities to unleash the infamous China gambling mania once again on stocks may be more about maintaining confidence in the economy – remember a strong stock market MUST mean a strong economy. Just as surging commodity prices meant surging global demand and a strong economy, right? Oh wait – that was nothing but reflexive shifts with China’s almost incessant credit impulse. We do note that the proposal comes amid a flurry of recent statements from top Chinese officials reaffirming the country’s commitment to financial reform.